I am looking for official pictures. I have tried to search e.g. through the VOA's archives, but have had no luck finding them. If such pictures were made by an American civil servant, as part of his/her duty see, they should be in the public domain (see e.g. this Wikimedia template). If such pictures were made by an Taiwanese civil servant, as part of his/her duty, they should be int the public domain (see e.g. this Wikimedia template). In 2002, Taiwan and the US signed a Judicial Mutual Assistance Agreement. Chen Ding-nan became Taiwan's first government official since the US cut diplomatic relations in 1979, to be invited to visit the White House. The process of signing the agreement was actually very dramatic. The US was dealing with the September 11th attacks and taking precautionary measures against terrorism. The country needed support from many countries, including Taiwan. Minister Chen invited a US diplomatic representative in Taiwan to his office. He then told him,"I want to go to the states to discuss matters regarding judicial mutual assistance." From the very beginning he declared that he wanted to go to the White House and meet the US Attorney General, who at the time was John Ashcroft. You know, at the time, Taiwan and the US did not have formal diplomatic relations. So this was a tricky situation. Up until the last minute, the message we received was that the highest official Chen would be able to meet would probably only the Deputy Attorney General. At the time Minister Chen still stood his ground saying,"I can not accept these circumstances." It wasn't until the very last minute that we were notified, that tomorrow's meeting, the US Attorney General himself would meet with Chen. Minister Chen was extremely happy. At the time he was being interviewed by Voice of America (VOA). The host even said, Over the past 23 years, this is the first Minister of Justice from Taiwan that is allowed to enter the White House. Have the official images perhaps been purposefully hidden away, as part of an attempt to bow to pressure of China? Or is it merely very difficult to successfully look for events in the archives of official state visits to the White House? 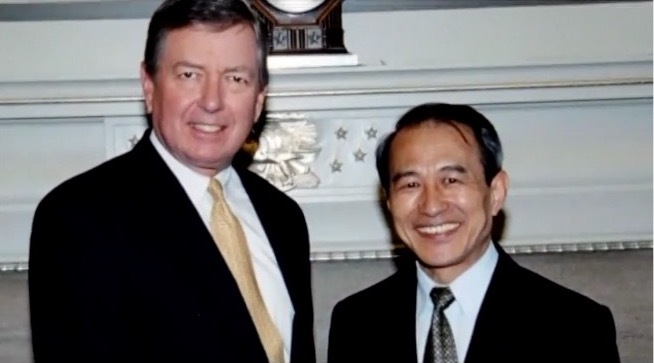 Chen Ding-nan visited Washington, D.C. from July 9-13, meeting with his counterpart John Ashcroft (see this press release). During the trip, Chen Ding-nan made some controversial comments about Taiwan's media (see here or here for some media coverage). A Chinese language article of 9 July 2002, (re? )published through VOA announces Mr. Chen's trip, characterizing it as a low-key visit from 9-13 July 2002. I have archived the page here, in case the original will go off-line. 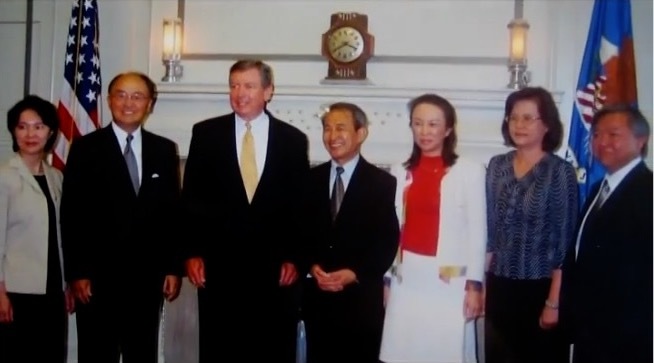 A Chinese language article dated 14 July 2002 of a blog of a lawyer (Daniel H. Deng) briefly describes Mr. Chen’s visit to the USA from 9-13 July 2002. A Chinese language news article from Taiwan, covering the same trip, dated 13 July 2002. A Chinese language news article dated 5 August 2002, covering the same trip, as well as anti-corruption efforts. Our Chief Director told me that there should be some photos in Taiwan government but not in USA. Due to the one China policy, they wouldn’t record Taiwanese politician’s visiting officially. Further more, I have been presented with four pictures through the Foundation documenting the state visit. I have created the following category on Wikimedia Commons, to which I have uploaded the pictures. In the mean time I have also created an English Wikipedia article on the topic of the state visit, entitled "Republic of China (Taiwan) 9-13 July 2002 state visit to the United States of America". Not the answer you're looking for? Browse other questions tagged united-states diplomacy taiwan or ask your own question. How many times did Robert Creamer visit Obama's White House? Precedents for White House plugging products?